McCormick & Company, Incorporated (MKC) engages in the manufacture, marketing, and distribution of flavor products and other specialty food products to the food industry worldwide. It operates in two segments, Consumer and Industrial. This dividend aristocrat has paid uninterrupted dividends on its common stock since 1925 and increased payments to common shareholders every year for 26 consecutive years. The most recent dividend increase was in November 2011, when the Board of Directors approved a 10.70% increase in the quarterly dividend to 31 cents/share. McCormick’s largest competitors include J.M. Smucker (SJM), Ralcorp (RAH) and Tootsie Roll (TR). Over the past decade this dividend growth stock has delivered an annualized total return of 9.50% to its shareholders. The company has managed to deliver a 11.30% annual increase in EPS since 2001. Analysts expect McCormick to earn $2.78 per share in 2011 and $3.10 per share in 2012. In comparison McCormick earned $2.75 /share in 2010. The company will be able to generate sales growth through acquisitions and joint venture, price increases, introductions of new products and expansion in its distribution channels. Recent acquisitions include a leading brand of Polish spices and has also formed a Joint Venture with Kohinoor in India. Major risks include inability to pass on price inflation to consumers as well as consumer’s switching to generic labels. While the company has a 50% market share in generic labels domestically, these products carry lower margins. McCormick has been able to maintain its position in branded spice products through constant innovation. 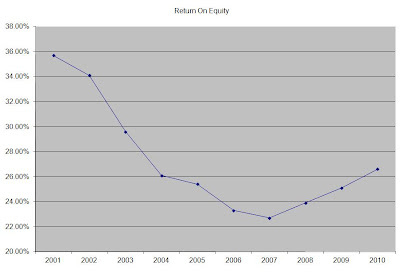 The company’s Return on Equty has decreased substantially over the past decade. This indicator seems to have bottomed out and is on the rebound as of recently. Rather than focus on absolute values for this indicator, I generally want to see at least a stable return on equity over time. 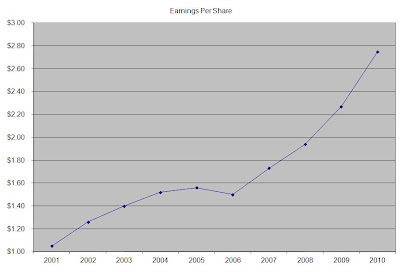 The annual dividend payment has increased by 11.20% per year since 2001, which in line with the growth in EPS. An 11% growth in distributions translates into the dividend payment doubling every six and a half years. If we look at historical data, going as far back as 1988 we see that McCormick has actually managed to double its dividend almost every six years on average. The dividend payout ratio has remained consistently below 45% over the past decade. A lower payout is always a plus, since it leaves room for consistent dividend growth minimizing the impact of short-term fluctuations in earnings. Currently McCormick is attractively valued at 17.40 times earnings, has a sustainable dividend payout and yields 2.50%. I would consider adding to my position in the stock on dips.